From our hyper-technological 21st-century viewpoint, it may be hard to believe it wasn’t always easy to know the time of day—or even where, exactly, we stood on the planet. But such an era wasn’t that long ago. C.H. 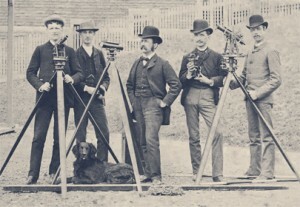 McLeod (flanked by students circa 1880) dedicated himself to the quiet study of astronomical data. As the longstanding superintendant of the McGill Observatory, he used his vast volume of readings to reconfigure the longitudinal readings of Canada. Starting in the 1840s, Dr. Charles Smallwood diligently recorded weather and astronomical observations from his home near Montreal. In 1863, the physician, by then an honorary McGill professor of meteorology, moved his pioneering weather forecasting efforts to a new stone tower beside McGill’s Arts Building. The aging Smallwood soon recruited his student C.H. McLeod to assist him with his studies. In 1874, one year after Smallwood’s death, the McGill Observatory was raised to the status of the nation’s “chief station,” telegraphing weather reports every three hours to the new Canadian Meteorological Service in Toronto. Following his mentor’s weather methodology, McLeod began combining telegraph communications with astronomical observations, made using a seven-foot telescope, to calculate McGill’s longitude relative to the continental reference point, Harvard College. Using an 1892 follow-up reading relative to the zero meridian at Greenwich, England, McLeod revised the longitude figure for Harvard—and, as a result, more accurately positioned every city, town, hamlet and farm in North America. But McLeod didn’t just tell Canadians where they were—he told them when, too. Following an international agreement at the 1884 Meridian Conference in Washington, D.C., to adopt a system of 24 global time zones, Canadians began setting their watches to McGill time. The McGill Observatory sent the official time signal by telegraph to railways and harbours nationwide and to such far-flung locales as Bermuda, Jamaica, the Azores and even some South Pacific islands. McLeod served as superintendent of the Observatory until his death in 1917, and the time-telling practice continued until radio technology made it obsolete in 1926.